NTT DOCOMO, Japan’s biggest carrier today announced a prototype of the world’s first SIM based authentication device that can wirelessly activate any compatible smartphone or tablet. Portable SIM is a SIM-based authentication device that can wirelessly activate ‘multiple devices’ erasing the need to have a SIM in each and every device your carry. User’s subscriber identity can be transferred from Portable SIM via Bluetooth by simply waving it next to a mobile device thus eradicating the need to physically insert a SIM card. The device was demoed by The Verge and Tech In Asia. 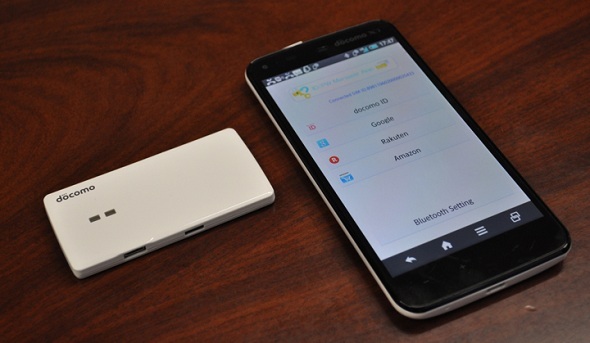 It shows how Portable SIM incorporated with a single SIM card uses a series of combination – Bluetooth and NFC to connect with smartphones, tablets and PCs. The SIM based authentication device can securely store and transfer IDs, passwords, and any other information which can be useful while online shopping and other sites. DOCOMO representatives demonstrated how phone calls could be made in a SIM-less device, by activating it through Portable SIM with a simple tap. NTT DOCOMO is planning to breakthrough a series of barriers in this field and come up with smart and feasible solutions. Its research and development team is currently working on key technologies, functions and service applications link to the device before its commercialization and to make it much more than just a Portable SIM Device. DOCOMO is also keen to break the barrier that is currently keeping the device from connecting with smart devices such as TVs, music players, in-car informatics systems in order to bring much more convenient products and services to its user base. “When people use multiple smartphones and tablets, this Portable SIM will be a very convenient way to allow you to link to all of them,” said Kazuaki Terunuma, managing director of the department, during the briefing. As of now, the company hasn’t decided when the device will be launched in Japan. Overseas sales possibility, for this kind of device would have to be discussed at International Standards Forums, according to DOCOMO officials. Currently, the prototype is 8cm long, 4cm wide and weighs about 20 grams. DOCOMO says that it will be shrunk, so that the device can fit into a bracelet-style wearable computer in the near future. DOCOMO has filed for patents on Portable SIM, and is hoping to revitalize the SIM based industry with its new technology. The device will be revealed at Mobile Asia Expo in Shanghai this week.